The successful Dubio brick continues to add awards to its name. 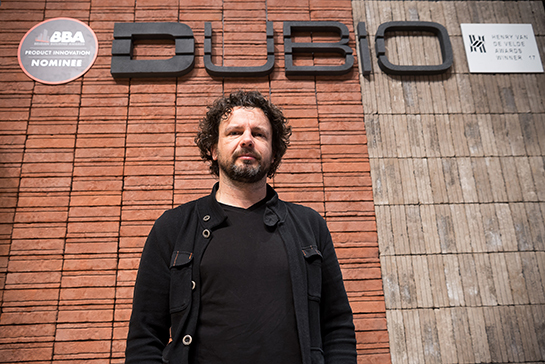 After winning the Henry van de Velde Award and the Product Innovation Award (Belgian Building Awards), the Dubio is now also the proud winner of the German Design Award. The unique creation of designer Roel Vandebeek, produced in cooperation with Nelissen Steenfabrieken, took first prize in the Building and Elements category. A number of projects are nominated for the prestigious German Design Award, awarded for the first time in 1969; these projects play a pioneering role and contribute to the German and/or international design landscape. According to the highly-respected jury of the German Design Award, the Dubio brick is a real winner in that respect. The spiritual father of the unique brick is designer Roel Vandebeek of the design agency Depot Roel Vandebeek. “Doing something special with normal objects, that’s the challenge for me”, according to Roel, who cooperated with Nelissen Steenfabrieken for the production. In brief, Dubio is the brick that uses shadow lines to create the illusion of thin stacked bricks. A game of perception and illusion that make it look like several thin bricks are glued on top of one another. The Dubio brick, launched at the end of 2016, is available in two versions. The Dubio 1 is divided asymmetrically with 1 shadow joint on the top so that the brick consists of two unequal parts. The Dubio 2, however, is divided symmetrically with two shadow joints, that divide the brick transversely into three equal parts. In this way the architect is given a construction kit, with a number of different combination options. With the Dubio brick’s unusual design, Roel Vandebeek and Nelissen Steenfabrieken show that the story of the brick continues to unfold. The brick is not only creative in a revolutionary way, the Dubio also makes a contribution in the area of sustainability. 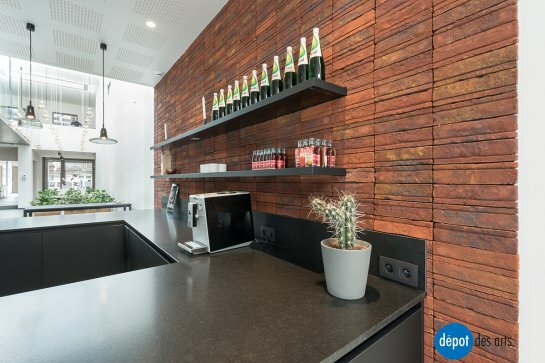 Based on Nelissen’s sustainable N70 brick, the Dubio is three centimetres thinner than a standard brick which means that it creates extra space. Moreover, the total weight of the bricks required is 30% less than when conventional bricks are used, resulting in a 30% reduction in transport costs. 20.03.2018 Showroom moves temporarily to "De Maalderij"
13.09.2017 The DUBIO Brick manufactured by Nelissen Bricks has been nominated for the Henry van de Velde Efficiency Award 2017. 08.08.2016 Nelissen Bricks goes international!